I’ve been a Braves fan for nearly 35 years. Most of those years were really good ones, so I’m certainly not going to complain about the investment of time and emotion I’ve put into the team. I’ve gotten to watch Dale Murphy, Tom Glavine, John Smoltz, Greg Maddux, Chipper Jones, Freddie Freeman, Ronald Acuña and scores of other amazing players and amazing baseball feats in that time. I watched my team win a World Series and play in many more. 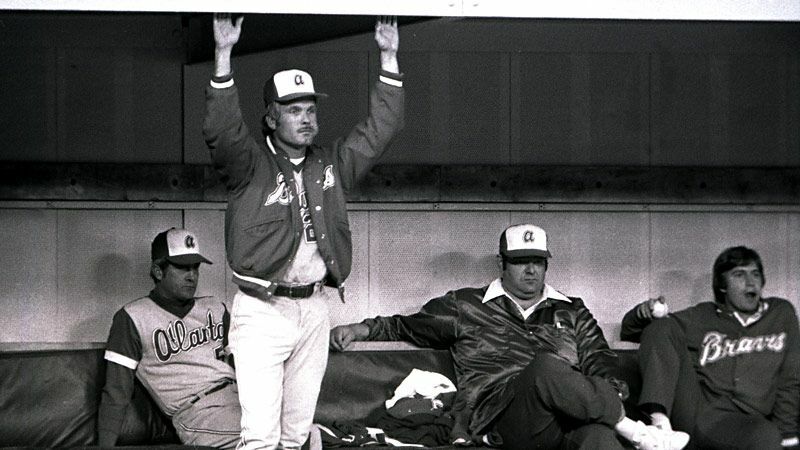 While there were a lot of lows at the beginning of that stretch, and a few at the end, being a Braves fan from 1985-2019 has given me way more good baseball memories than bad ones. And heck, even the bad ones have been fun sometimes. At the moment I should be enjoying some of those good times. The Braves unexpectedly won the NL East last year and they did so with a bunch of exciting young players that should be around for a good while. That’s the stuff that sustains you as a fan: winning baseball and guys you want to root for. But I’m having a really, really hard time enjoying the Braves at the moment because, quite simply, the team’s front office thinks I’m a friggin’ moron. That’s the only conclusion I can draw from this interview of Braves team president Terry McGuirk and general manager Alex Anthopoulos, conducted by David O’Brein and Jeff Schultz of The Athletic. It’s a masterwork of condescension, dishonesty and, at the end of the day, constitutes a clear signal that the Braves care about profits, first, second, third and foremost. “Sure, winning baseball is pretty spiffy, but let’s not keep our eyes off the prize, which is ‘financial flexibility,'” the Braves brass seems to be telling us. Don’t just take my word for it. Let’s get all 2004 here and fisk this bad boy, shall we? Except they haven’t spent more money. While they signed free agent Josh Donaldson to an unusual one-year, $23 million deal, the fact of the matter is that payroll has remained completely flat. Money came off the books in the form of Matt Kemp‘s contract and other “dead money,” to use McGuirk’s term, and Donaldson merely brought them back to even. McGuirk does not say what the payroll is at the moment, but eyeballing it, it seems to be, more or less, the same as it was last year. Which was, more or less, the same as it was the year before. Which is fine until you realize a couple of things. The first thing being that the Braves moved into a lavish taxpayer-funded stadium a couple of years ago that, in addition to representing a new revenue source of its own, is surrounded by a massive commercial development in which the Braves have a stake. Last year, it was reported, the Braves’ revenue increased by $124 million. Just as an increase. The entire runup to the new ballpark was filled with both explicit and implicit statements from team officials that it would allow the Braves to be more competitive and spend more, but they haven’t. They have pocketed the revenue rather than spend it to improve the baseball team. Dude, fans don’t root for “flexibility.” “Flexibility” flags don’t fly forever. The alpha and omega of fans’ concern about “financial flexibility” — the only reason any of us care about payroll and budgets and stuff — is the degree to which those things make it more or less likely for the team we root for to acquire good players and win consistently. We’re not rooting for your bottom line or your ability to go into a meeting with your bosses and say that you still have some budget left over for fiscal 2020. Spending now is about winning. It’s not about building as much. Alex’s mandate is to advance the ball from where we were last year in the playoffs. I read where all of the prognosticators have us winning 82 or 84 games. I love being the underdog. The fact that we can take that $126 million and put it on the field, plus an appreciable move beyond that, is unprecedented for us. We’ve been a bottom-10 payroll team for a couple of years. We’ve messaged that we want to get to the middle, and I think this year begins to get us to that neighborhood. I expect that we push beyond that in the coming five years. The only reason he cites that 82-84 win prediction from “prognosticators” is so he can dial the Braves’ competitive clock back a year and, with it, expectations about payroll. Indeed, I can’t see any other way to read this than, “you spend to put you over the top, but pundits think we’re not likely to win, so we’re gonna show them, we’re gonna win, and then when we do we’ll spend more.” Which is all great as long as you forget that the Braves are, you know, the defending division champs and that, under that model, they should be spending more NOW in order to consolidate last year’s gains and to try to push deeper into the playoffs. The interview is filled with that kind of sleight of hand. One minute McGuirk crows about what the team spent last year — “We had a $126 million payroll! We spent money!” — and then the next minute he discounts $30 million of that as “dead money,” and wants credit for fielding a division champ that really only had $96 million on the field. If he were honest he’d admit that a team is more than capable of winning when it carries even some bad contracts, which he and Anthopoulos adamantly claim they cannot, thus their wariness of signing a big free agent. Or, at the very least, he’d admit that what he really wants is to win as cheaply as possible. Later in the interview we get what is now a well-worn cliche among front office types. The “sure, we’d like to have good players, but . . .” comment, which is really aimed at making fans and inquisitors feel dumb. It leverages the credentials of the speaker and his authority as a front office genius to explain why it’s better to have a three sub-par corner outfielders than one great one or whatever. Sure, one can make that argument given a certain set of players, but these days the argument is rarely attempted with any sort of specificity. The “oh, we’d love to have ____” quote is now left to stand alone, sometimes followed up with references to how high the team is on a young player or three who has no shot at ever being as good as the big name player being dismissed. Q: Do you agree acquiring a No. 1 or 2 starter would elevate you to that next level? Anthopoulos: No doubt. But what I’d say is we were (fourth) in starters’ ERA (3.50) last year; we are really bullish on some of these young kids. He goes on to talk about how Luiz Gohara just didn’t put it together last year and what a shame that was, as if citing Luiz friggin’ Gohara is at all responsive to a question about a number one or number two starter for a defending division champion. It’s a subject-change to the matter of potential back-end help or a guy who may possibly be good in the future, not an answer to the Braves’ need for a frontline starter. In doing so, Anthopoulos, like McGuirk before him, is consciously trying to tamp down fan expectation. To make them think that the Braves are in rebuilding mode instead of winning mode. To make them think that the most important question about the rotation is whether the no doubt potential-filled Gohara can turn a corner rather than who is going to take the ball in Game 2 of the NLDS should the Braves make it that far. “Sure, we’d love to have a great player,” the cliche goes, “but we’d much rather you all think more about the cheap young players who might be good if everything breaks right” it may as well finish. Except it does not “go into our team,” as the numbers and as McGuirk’s and Anthopoulos’ own answers demonstrate. Well, at least not into the baseball playing part of the team. It certainly goes into the team as a whole, which is both a sports-playing enterprise and a business enterprise in and of itself. Indeed, as team president, when McGuirk talks about what’s good for the Atlanta Braves, it should be read as him talking about the business enterprise more than the sports-playing enterprise. After all, that’s his job, right? At the end of the day, he is fired by his bosses at Liberty Media if the Braves lose money but he is not fired if they merely lose baseball games. Brian Snitker is fired if the team loses baseball games. Maybe, eventually, Alex Anthopoulos is. But McGurik is not. The savvy among us know that team brass — certainly team ownership — has viewed things like that forever. That they’re a business first and that it’s better to make money while losing baseball games than to lose money under any circumstances. Books have been written about that and the business of baseball is best understood if you view it through that lens as well. There have been some crazy, loose cannon owners who seem to not care about how much money a team makes as long as the team wins — the Braves, actually, used to have one — but they are exceptions to the rule, historically, and as of now none seem to exist. Modern team brass depend on most fans not realizing that, though. They depend on fans believing that we’re all in this together for the glory of baseball and victory and all of that stuff. That is why they craft their euphemisms they way they do. That is why, when they do not appear to be doing things that will help the team win in the short term, they couch the moves in terms of “sustained success,” with the implicit promise that more winning will come later even if it doesn’t come now. That is why they explain seemingly cheap moves as moves that “maintain financial flexibility,” with the implicit promise that while money is not being spent now, it will be spent later. That is why, when they pass on a seemingly fantastic free agent, they focus attention to the potentially bad final years of a contract rather than focus on the early years in which a championship might be won, implicitly casting the free agent as sour grapes best not eaten. If front office brass were honest about that stuff — if they talked about how they care more about profit than winning — the relationship between teams and fans would look very different than it does. It would make leveraging the passion of fans into revenue much, much harder because, let’s face it, we buy merchandise and tickets and vote to increase our taxes to subsidize their stadiums because we think it’s about winning, not because we think about how we’re increasing the revenue of a multi-billion dollar conglomerate like Liberty Media. But in this interview, Terry McGuirk and Alex Anthopoulos barely even attempt to hide what it’s really all about. They barely try to sell the line all front offices try to sell when making excuses for their behavior. They all but flat out admit that profit is what matters, barely attempting to offer plausible cover stories about how it’s really about winning baseball games. Why aren’t they trying harder here? All I can conclude is that they think you’re too stupid to know any better.